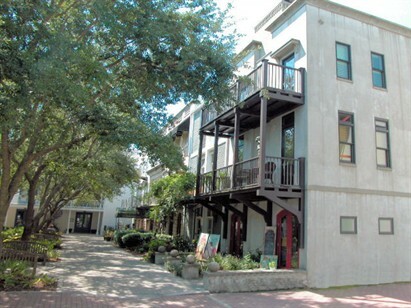 Tuscany is a spacious, stately townhome perfectly located in the heart of Ruskin Place Artist Colony. The second floor includes a fully-equipped kitchen with granite counter tops, a bar and stainless steel appliances. The adjoining living/dining area with granite fireplace and a furnished balcony overlook oak-shaded Ruskin Park. The master king bedroom also has a fireplace and private bath (shower only) and is situated on the third floor with its own furnished balcony. A second bedroom has three twin beds with a hall bath. A deck on the fourth floor has incredible sunset Gulf views. For additional room, the one-bedroom studio, Siena, may also be rented. Browse more pictures of Tuscany. Watch the virtual tour of Tuscany.